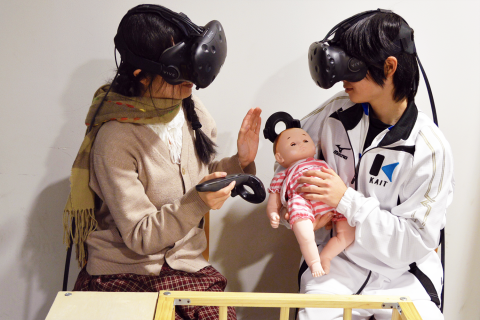 Nursery Simulator Entertainment VR “Real Baby – Real Family” is the sole winner of the international award at International collegiate Virtual Reality Contest (IVRC2016). Utilizing deep learning, the team realized age inverse morphing for baby face generation from any facial image. This, combined with audio-haptic feedback, and baby mockup allows players to experience a variety of nursery activities in a safe and game-like environment. During France Laval Virtual, this project was awarded the ACM SIGGRAPH Award and therefore gets the opportunity to present at SIGGRAPH Emerging Technologies 2017. The development of "BabyTech", smart baby care environment has become an important topic throughout the world. BabyFace, a startup company preparing to launch from Shirai-lab of Kanagawa Institute of Technology, and Xenoma company’s Smart Skin are starting to use IoT device in an effort to improve baby care environment and propose a new quality of life with natural baby development by entertaining, safe, and feasible new home electronic solutions.